Twitter chats are curated conversations on Twitter connected by a unique hashtag, at a specific time and can last for up to an hour. They have become a great way to connect, network, and meet new people online. 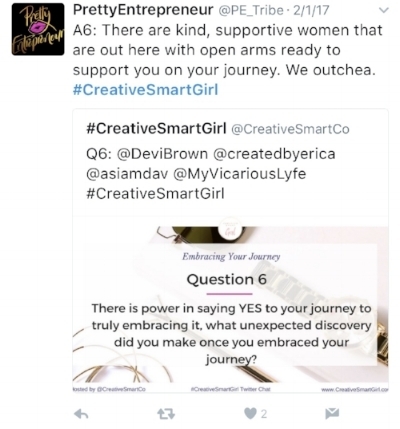 The #CreativeSmartGirl twitter chat is known for bringing together the most successful women, who are winning in their industries. Believe it or not, many people don’t use Twitter or the interactive discussions hosted on the platform to drive their networking efforts. Although there are plenty of great offline methods of networking, online connecting can be effortless with all of the same rewards if you follow up properly. Twitter chats can be used to gain brand awareness, drive traffic to your website, and attract new followers. There are plenty of reasons to begin participating or consider hosting a Twitter chat, including the fact that there are over 200 million monthly active users and 34% of marketers use the tool to generate leads. Also, half of Instagram users are active on Twitter. Whether you are the host or a participant, being vocal about chats on other platforms can help you reach your engagement goals. Joining our monthly #CreativeSmartGirl chat for the first time can be overwhelming due to a high level of engagement. Research the topic: Most chats have a main focus or topic that everyone will be weighing in on, and it’s probably what attracted you to the chat in the first place. If you only have a vague understanding on the topic, you may want to do your homework so you’ll be well prepared for questions and can even share some insights of your own. The purpose of Twitter chats is to share the lessons we’ve learned in life and career, you won’t want to be without the ability to shed light on a topic. Research the guests: If you are participating in a chat that has featured guests, it only make sense that you should find out what you can about them before diving into conversation with them. If a guest is someone you already know and want to connect with, this is the perfect time to show your interest. Asking for advice and help from people who you haven’t taken the time to get to know won’t help you. Showing guests that you support them is a great way to get them to engage with you personally during the chat. Learning more about the guests and the host can increase your chances of adding them to your personal network and can add context to the chat. Everyone participating was asked for a reason, have an idea why before it begins. Follow the hashtag: Following the hashtag allows you to see what types of conversations are had and who usually shows up for that particular chat. Look for people you’d like to connect with. Once you’ve made your list of people you want to meet, you can go into the chat with a plan of exactly who you’d like to connect with and their area of expertise, and minimize the pressure. Put a reminder in your phone: Missing the gems is not what you want to do. Take out your phone and schedule the #CreativeSmartGirl chat for first Wednesday of each month at 8pm EST. You’re welcome! Charge your phone: Make sure your phone is fully charged before jumping onto a twitter chat. It can really drain your battery. Don’t miss out on all the gems because your phone dies right in the middle of the chat. Take Notes: There is so much knowledge shared during twitter chats, do yourself a favor by writing down some of the gems shared throughout the chat. For the #CreativeSmartGirl chat we provide a chat notes sheet and for each chat. You can sign up here if you’d like to receive it. Grab your notes sheet, pen, and just wait for all the gems. Follow up: This is obvious but so important. What’s the point of going out of your way to meet new people if you are never going to talk to them again? You build relationships by continuing to communicate with others. After the chat is over, take the time to follow the users you’ve engaged with and others that may have followed you. Within the next 24 hours, send a direct message or email to the participants who you made a real connection with. Don’t feel the need to ask for anything but open up the lines of communication, and be sure to greet them individually in the next chat to build that relationship. Show support: Establish yourself as a supportive community member by showing gratitude to the host, thanking them for the experience and expressing interest in returning for the next chat. In terms of networking and personal branding, this can put you on the host’s radar and get them to support you as well. Don’t use the hashtag to promote yourself or your business unless you’re introducing yourself. Also, you don’t want to use the hashtag to promote your products when the chat isn’t going on to get more traffic, it’s misleading, dishonest and disrespectful to creator of the chat. Do respond to other users tweets and RT responses as much as possible. Do invite and remind others of the chat in your personal network.